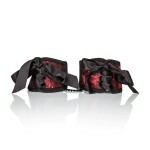 Scandal Corset Cuffs are totally adjustable cuffs with sensual lace up design. For use on wrists or ankles. Velcro style and lace closures. Soft and plushy on one side with designer fabric on the other. Heavy duty metal chain with universal clasp. Safe and pure for body and pleasure. Made using phthalate free materials: non-tarnishing, nickel free, Polyester fabric, lining, ribbon, Velcro, nickel free iron chain, D-rings, rivets, nickel free Alloy clips, Polypropylene PP webbing. Cuffs adjust up to 11 inches.